So I’m in a bit of a baking frenzy at the moment, working my way through that ever-growing list of recipes to try (of which many are from Mary Berry). Luckily I can also fundraise for a good cause with the delicious results. Two of my colleagues have paired up with friends to complete the Oxfam Trailwalkers challenge; a 100km walk over 48 hours with an aim to raise funds for Oxfam and the important work they do. While I would not sign up to walk 100km myself, I do think it is an excellent cause and would like to help them out by doing my bit to raise donations. So this loaf cake is one of many treats my office will be enjoying over the next two weeks (in exchange for a donation). 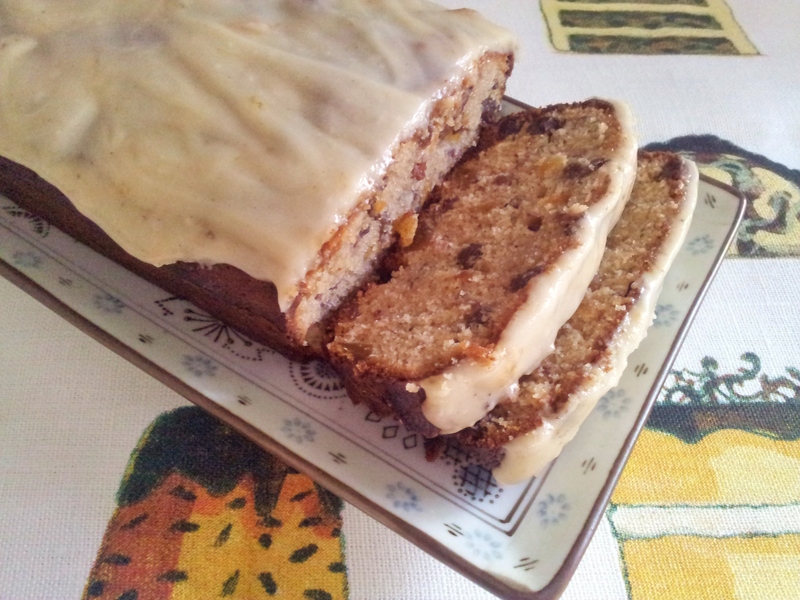 A simple cake, dotted with dried apricots, it is nonetheless delicious and something different from the standard current and sultana fruit cake. This cake will overcook easily so be sure to keep a close eye on it, checking every 10 minutes or so (sooner when it is nearing done), as every oven is different. Preheat the oven to 160° and grease a large loaf tin and line with baking paper. Quarter the cherries and drain on paper towel to dry. Break the eggs into a large bowl and beat briefly. Measure the remaining cake ingredients into the bowl and beat well until the mixture is smooth. Stir in cherries and pour into the prepared tin. Smooth over and pop into the oven. Bake in the oven for 1 hour and 10 minutes or until the cake is golden brown and shrinking away from the side of the tin. A cake tester should come out clean; test at the 40 minute mark. Leave to cool in the tin for 10 minutes and then turn onto a wire rack to finish cooling. While the cake cools, make the icing by warming the apricot jam and water together until smooth, then sift in the icing sugar and stir briskly until combined. Spread over the cooled cake and decorate with the remaining chopped apricots as desired. Next Post Au revoir – we’re off to France! This is a good, plain cake (I didn’t use the icing altho’ it might have added a pleasant texture). 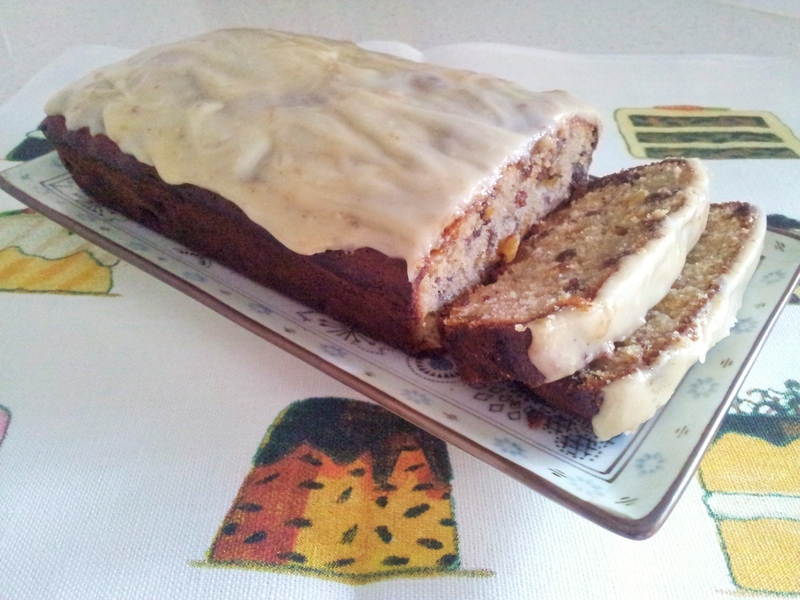 As with the marmalade tray bake, I used golden glace cherries which provided a complementing colour. The fruit loaf had a pleasant texture and sliced well. It’s popular with people who aren’t fond of a large amount of dried vine fruit.